The United States District Court for the Eastern District of Wisconsin (in case citations, E.D. Wis.) is a federal trial court of limited jurisdiction. 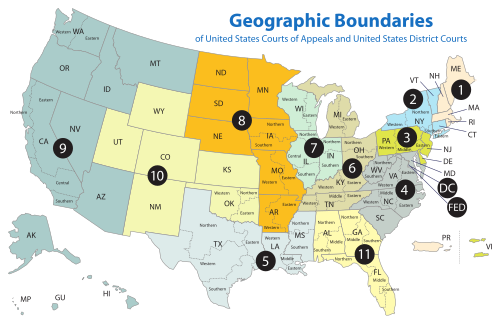 The court is under the auspices of the United States Court of Appeals for the Seventh Circuit, although patent claims and claims against the federal government under the Tucker Act are appealed to the United States Court of Appeals for the Federal Circuit. The Eastern District was established on June 30, 1870. The district's headquarters, central courthouse, and the majority of its offices are located in Milwaukee, Wisconsin, but the northern counties of the district are serviced by a courthouse in Green Bay, Wisconsin. Currently, Judge William C. Griesbach, chambered in Green Bay, is the district's chief judge; the United States Attorney for the District is Matthew Krueger. The United States District Court for the Eastern District of Wisconsin is one of two federal judicial districts in Wisconsin. Court for the Eastern District is held at Green Bay and Milwaukee. Green Bay Division comprises the following counties: Brown, Calumet, Door, Florence, Forest, Kewaunee, Langlade, Manitowoc, Marinette, Menominee, Oconto, Outagamie, Shawano, Waupaca, Waushara, and Winnebago. Milwaukee Division comprises the following counties: Dodge, Fond du Lac, Green Lake, Kenosha, Marquette, Milwaukee, Ozaukee, Racine, Sheboygan, Walworth, Washington, and Waukesha. 4 James Graham Jenkins WI 1834–1921 1888–1893 — — Cleveland appointment to 7th Cir. 5 William Henry Seaman WI 1842–1915 1893–1905 — — Cleveland appointment to 7th Cir. 8 F. Ryan Duffy WI 1888–1979 1939–1949 — — F. Roosevelt appointment to 7th Cir. 14 Terence T. Evans WI 1940–2011 1979–1995 1991–1995 — Carter appointment to 7th Cir. ^ Warren was nominated for a seat on the E.D. Wisc. by President Nixon, but he was confirmed after Nixon's resignation and was appointed to the Court by (i.e., received his commission from) President Ford. This page was last edited on 11 April 2019, at 04:53 (UTC).